This new feature of Google Maps for Android is available in the U.S. and Japan can find their way inside airports, railway stations, shopping centers and stores of major retailers. When the user is in one of these places, they simply visit Google Maps and zoom in on the location to open the domestic front. A blue pointer indicates where it is located and the plan is updated automatically as the person moves. 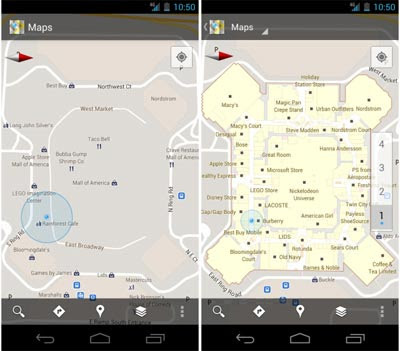 Maps 6.0 contains more new features, the former available for all users. First, there is a dropdown menu that facilitates unprecedented access to services including Google addresses, Navigation and Latitude. There is also a home screen improved to Google Places which broadcasts Searches corresponding to the location of the user.